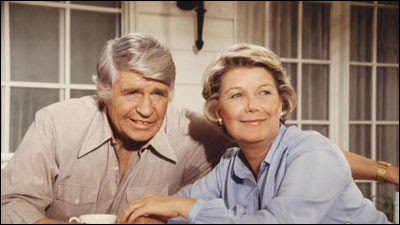 The Plot (Courtesy of TV.com): Jock sends an announcement regarding Ewing Oil from South America; J.R. confronts Dusty; Donna awaits news on her book. Well, ladies and gentlemen, this particular Brief Dallas Interlude may turn out to be one of the shortest ever. To give some context, I had no recollection of these two episodes of Dallas, at least not as episodes featuring Gary and/or Val. Pretty much all the other episodes where they stop in for a crossover visit I could remember just by thinking back over the run of Dallas, but when I saw these two episodes listed as featuring one or both of them, I was like, “Now what damn episodes are those?” In truth, the entire run of Dallas kinda blurs together for me now, and it’s hard for me to remember individual episodes the way I can remember individuals of KL. But in any case, I did my research, I lined up where these Dallas eps aired in conjunction with KL, and I squeezed them in on my last trip to My Beloved Grammy’s house. The reason this will be such a tiny essay is because it barely counts as an Interlude. I felt fidgety most of this episode as I watched the Dallas shenanigans unfold before me, and I even started to wonder if maybe my research had been flawed, if maybe we’d sit through this entire episode without seeing either Gary or Val. But they both do indeed show up; it just happens to be for about, oh, maybe 48 seconds out of a 48 minute episode. 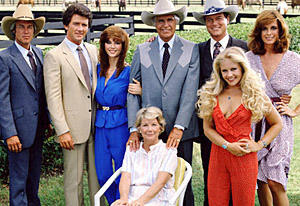 To put a little context into what’s going on over on Dallas at this point, I suppose it’s important to note that Jock Ewing is not yet dead on the show. The actor Jim Davis is dead in real life, but at this point, his character is in South America doing stuff. I believe he is pronounced missing about halfway through this season and is finally OFFICIALLY announced dead during the next season, the 1982-1983 season. So in this episode, a lot of the plot centers around a letter Jock sends from South America about how he wants to divide up Ewing Oil voting shares in a certain way. Miss Ellie reads out these voting shares to the family and we learn who gets what. Gary gets a quick mention with, “Garrison Arthur Ewing gets ten voting shares.” Okay, you all following along? Then at a certain point in the episode, Miss Ellie says how she has to call Gary in California. Well, that’s when we get the 48 second scene. We start with an exterior shot of Gary and Val’s house on Seaview Circle, and that was good, and then we go inside as Gary is hanging up the phone. We’re in the familiar location of Gary and Val’s kitchen and Val is chopping vegetables or something. Actually, this was some surprise because I knew Gary would be in this episode but I forgot that Val was, as well. Anyway, he announces he’s gonna go to Texas and Val says, “Oh Gary, you know what happens every time you go to Texas!” Gary does a callback to our last Interlude by saying, “We went for Lucy’s wedding and that turned out fine.” That’s basically the whole scene. Again, not terribly exciting. Still, even if it’s only for a few seconds, Gary and Val do show up in this Dallas episode and so, as a stickler for completionism, I felt compelled to include this episode. However, how will things flow jumping from this Dallas and back into KL with Moving In, only to then immediately jump into another Dallas with Five Dollars a Barrel? Will a perfect continuity be maintained? I guess we’ll have to find out in our next discussion. Talk to you then. REUNION: PART ONE, REUNION: PART TWO, SECRETS, RETURN ENGAGEMENTS, NO MORE MISTER NICE GUY: PART ONE, NO MORE MISTER NICE GUY: PART TWO, END OF THE ROAD: PART TWO, FIVE DOLLARS A BARREL, JOCK'S WILL, THE FAMILY EWING, AND CONUNDRUM.